﻿The new 2018 Nissan Titan and Titan XD are here and ready for it all. Billion Nissan of Sioux Falls, SD and Sioux City, IA have many new 2018 Titans in stock, ready for you to buy, lease, or finance. This Nissan truck is durable, with a reinforced, fully boxed, full-length ladder frame. The Titan Endurance® V8 gas engine has 390 horsepower and 394 torque lb-ft. The 2018 Titan is available in Single Cab, King Cab, or Crew Cab. Trims include S, SV, SL, Midnight Edition, Platinum Reserve, and PRO-4X. 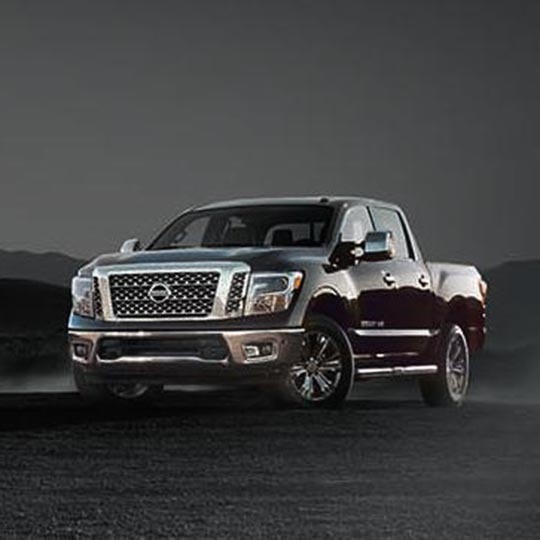 Shop all our new Titan truck inventory if you don't yet know which new Nissan truck is right for your lifestyle. Be sure to service your vehicle with Billion to keep it running in its best shape. Purchase the Nissan ﻿parts and accessories﻿ you need to personalize your new 2018 Nissan Titan or Titan XD. Schedule a test drive today in Sioux Falls or Sioux City.